Beijing Evening News (June 20, 2009): Caring for the Common Swift in Beijing: Saving more than Swifts! When the article “Swift, where is your home now?” was published on June 18th in the Beijing Evening News, many readers showed their interest and gave us their advice on Swift conservation. Now that the Olympic Games have finished and their memory is fading from people’s minds, why do we continue to talk about the protection of Swifts? It‘s because the Swift is an inseparable part of Beijing’s traditional culture. When we talk about the styles and features of the capital, we always think of the vigorous and nimble creatures that fly up and down between the red walls and the green tiles. The Swift has become part of the Beijinger’s daily life. The visible effort they undertake to find food, and the screaming parties they so obviously enjoy in the evenings always move people‘s heartstrings. The Swift is a potent symbol of Beijing. It’s just as important for us to protect the cultural aspects of the Swifts‘ relationship with Man, as it is to protect the ecological balance. Chen has lived with his Swift neighbours for 50 years! There is a series of four-floor high pitched-roof buildings in the Yong’anli sub-district in Beijing, most of which were built around 1958. 76-year old Chen has lived there for half a century, and he has had Swifts as neighbours for the same period. The Swifts always arrived there at end of April, and they left between August and September after hatching one or more clutches of chicks, Chen told us. Chen lives on the fourth floor. Every summer morning he always heard the screaming sound of the Swifts‘ calls from the top of the building. They flew up and down above people’s heads in the evening. There were some Barn Swallows and Red-rumped Swallows as well as the Common Swifts. This summer there were fewer Swifts than in the past years. At the beginning of this year the buildings where Chen lived in were repaired. Some of the gables were removed and some of them were sealed. 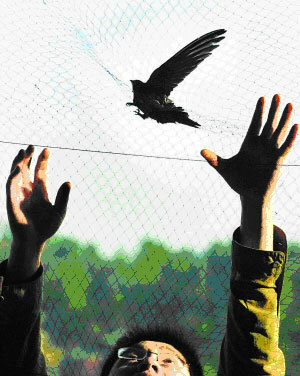 “The Swifts couldn’t find their old nest places, so they didn’t come this year.“ Chen said. Chen told us about his feelings for the Swifts. He even sang a song about his Swifts for us: Swift! Swift!, See you next year! Please fly to the South Seas now! It’s getting colder and colder in the North. You needn’t be sad to leave us! The earliest relationships between Beijingers and Swifts go back to the Neolithic (New Stone) Age. Zhu Lei, a volunteer of the Beijing Birdwatching Association, told us „Don’t forget that Beijing is also known as „Yanjing“ (the Swift Capital). According to Zhang Zhengwang, ornithologist and professor at the Beijing University, the “Black Bird“ in Chinese Yin and Shang Dynasty mythology, and also the “Hu Yan“ in Song and Ming Dynasty are in fact the Common Swift, Apus apus pekinensis. Some scholars believe that because of the limitations of Swift banding there is not enough data to discover the migration route, and the true status of the Swift. Zhulei said that a 10 year old banded Swift was recovered during this year‘s banding at the Summer Palace. This Swift is the oldest that they have recaptured for 12 years. From Qianmen to Jingshan, the Forbidden City of Beijing used to be the largest known single Swift habitat. Swifts are very different from other birds. Their four toes face forward. So they cannot stand on the ground, nor perch on wires or branches. If they fall to the ground they may have trouble getting airborne again. The swift has adapted itself via evolution to live in rock faces and cliffs. That’s why they chose high buildings as their habitat when they expanded to live in our cities. The most important question is, how do we embody ancient wisdom regarding birds and wildlife into the design of our modern cities? Why do we have to let human activities damage or destroy wild birds? Zhao believed that the ideas of ancient peoples should have the power to enlighten those responsible for modern city development. We should strive to co-exist with trees, insects, birds and other creatures that share our cities. Such questions as migration and the continued breeding of wild life must be considered when we undertake city planning and development. In a word, it's impossible to ignore human' profit when we talk about the conservation of birds. The converse is also true. God sent the Swift down to the world, and Shang gave birth to Jiandi, the mother of Qie, the founder of the Shang dynasty.